The original Salem Evangelical Lutheran Church of New Millport, in Knox Township, was constructed in 1843 by then recent German immigrants and settlers. A later wooden structure was built before the present red brick edifice was dedicated in 1896. 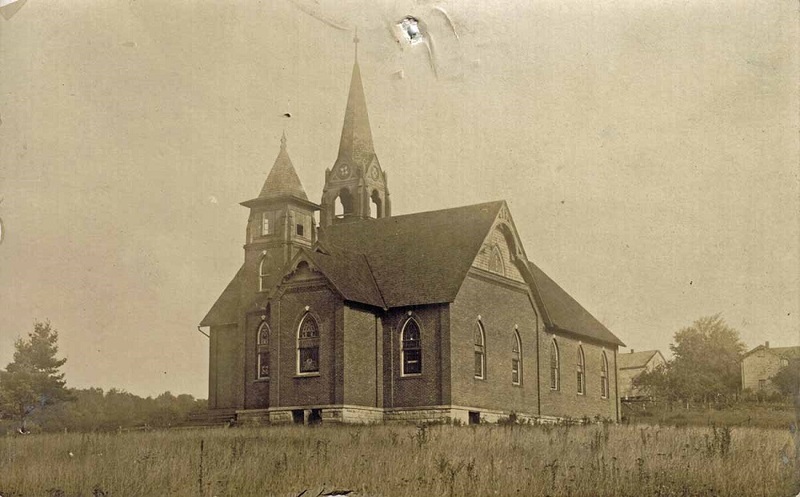 The photo shown depicts the church, as it would have looked in the first decade of the 20th century. The wooden roof shingles are apparent as is the old-fashioned open bell tower. Many churches, that once had such belfries, have replaced them with fiber glass steeples due to easier maintenance. Open towers often were the source of roof leaks. The overall design, though, on the church is as impressive as is the cut stone foundation. The most unique feature of the church is the square oak panels that form the ceiling. Throughout the decades, parishioners have donated to have individual and family names inscribed on them. The ceiling panels make up a form of living history within the church building itself.